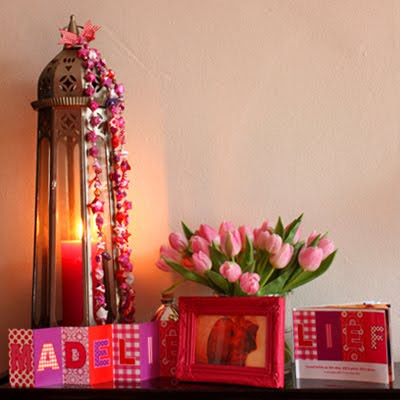 The star garland, partially made of the birth announcement cards, now adorns a highly personalized little altar where a candle is kept burning for Madelief. Madelief is such an appropriate name too: a madelief is a daisy. The poet Chaucer called this perfect little flower the ‘eye of the day’. Indeed, its yellow centre resembles the sun, an eye looking up at the heavens. On top of that lief in Dutch means sweet, lovely. We hesitated to write this article, but Marieke assured us she is comfortable with this. They want their perfect little girl to be remembered as much as possible. Marieke, Richard and Fien, you’re so brave! Lots of love to you. May Madelief continue to keep an eye on you from the heavens. Thank you for daring to write this piece. Beautiful and poignant. 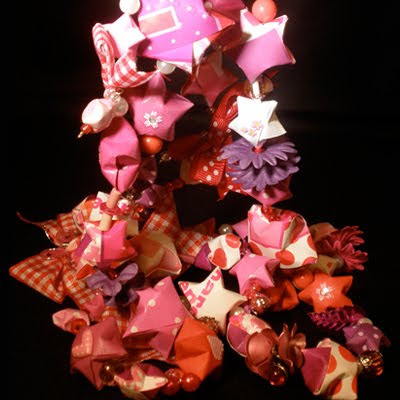 What a beautiful remembrance, a garland from cards into stars...kisses for little Madelief, so loved..
'Wow! 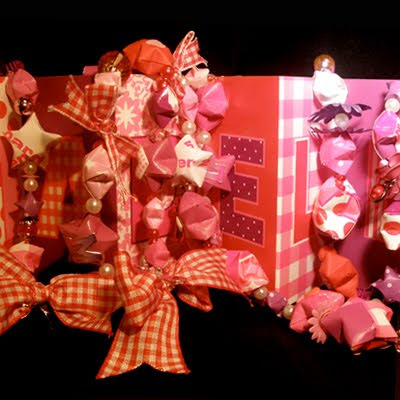 What a beautiful blog especially for my little Madelief, my lovely daughter. Your star garland shines spectacular in the candlelight and thanks to your article Madelief will live in even more hearts all over the world. :(((( wat een mooie herinnering. Sterkte gewenst aan de ouders. Madelief has the sweetes little face. What a pretty girl! So tiny and yet so wise in her eyes. The garland suits this very well. May Madelief bring love into the world from where she is now. What a sweet angel and what a beautiful remembrance. wat mooi!! krijg er gewoon kippevel van. Veel sterkte voor Madeliefs ouders en familie. Heartbreaking and beautiful. Thank you for sharing. Hola! Realment ha estat molt exitant trobar paraules en català de dues germanes holandeses al meu blog...:) la vida està plena de sorpreses. Jo sóc russa i visc a Mallorca :)...Gràcies per tot! Tenim massa coses en comú. Us segeixo. Una abraçada molt forta a les dues! i am so emotional and touched reading this. I can feel the heartbreak, and yet the immense love shared here. So sad, but so beautiful. Thank you for sharing. What a lovely and touching tribute. 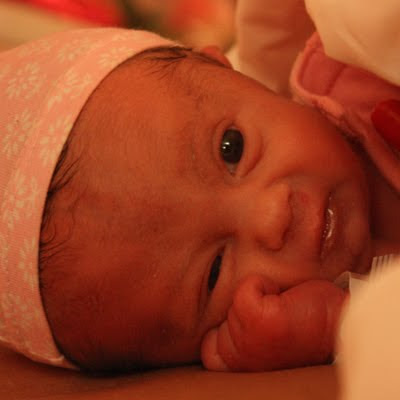 It's so hard losing a little one; I still tear up remembering my newborn niece.